A few years ago when we were visiting Mike’s parents in Florida, they took us out to eat at one of their local restaurants. Mike and our oldest daughter ordered chicken breast that was smothered in cheese, onions and mushrooms. They liked this chicken so much that we have made it at home ever since. The thing that I like about this is it is versatile. As far as cheese goes mozzarella tastes great on this chicken, but colby jack tasted just as well. And I am sure that you could use just about any kind of cheese that you like and it would taste wonderful on this chicken. You can serve it with sautéed onions, mushrooms, peppers, and the list goes on. Use your imagination and go wild. In my family once again we face the dilemma that not everyone likes the vegetables. So what we like to do with the sautéed vegetables is to serve them separately from the chicken and this way you can choose what you want on top. 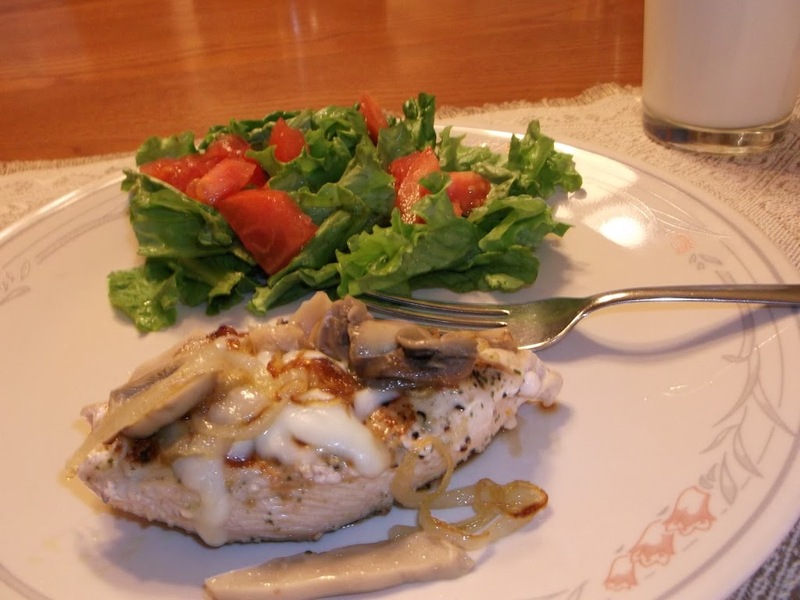 We like to use our George Foreman Grill for this recipe, but we have broiled it as well. Either way it turns out perfect. So for a nice healthy chicken recipe I hope that you will give this a try. It truly is one of our family’s favorite. Sauté onions, mushrooms, green peppers, red peppers, or what ever vegetables you enjoy sautéed . Cheese – mozzarella or your favorite cheese. Brush olive oil on the George Foreman Grill or broiling pan to prevent sticking. Season chicken breast to your taste with favorite seasoning. Slice vegetables and sauté as the chicken is cooking. 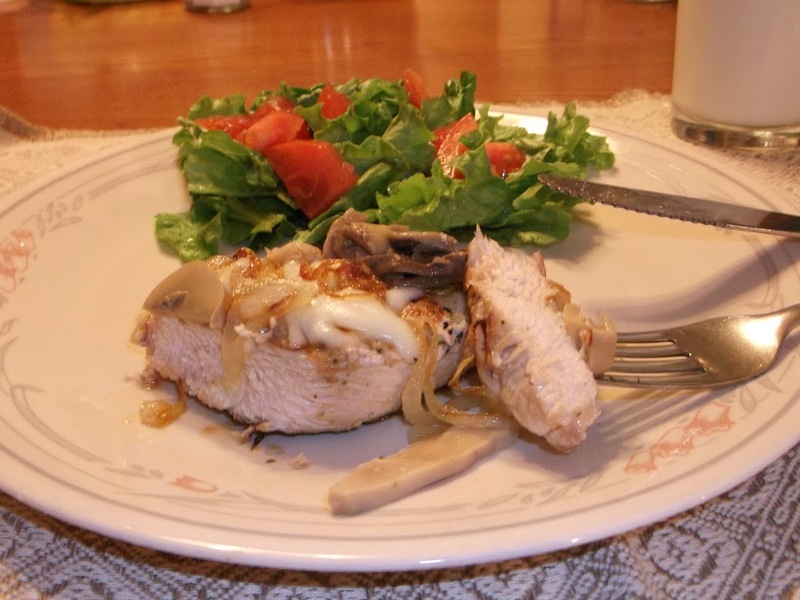 Grill or broil chicken breast until completely done (time will be determined by the size of the chicken breast). Once chicken breast and vegetables are done to your liking top chicken breast with your favorite vegetables and enjoy! 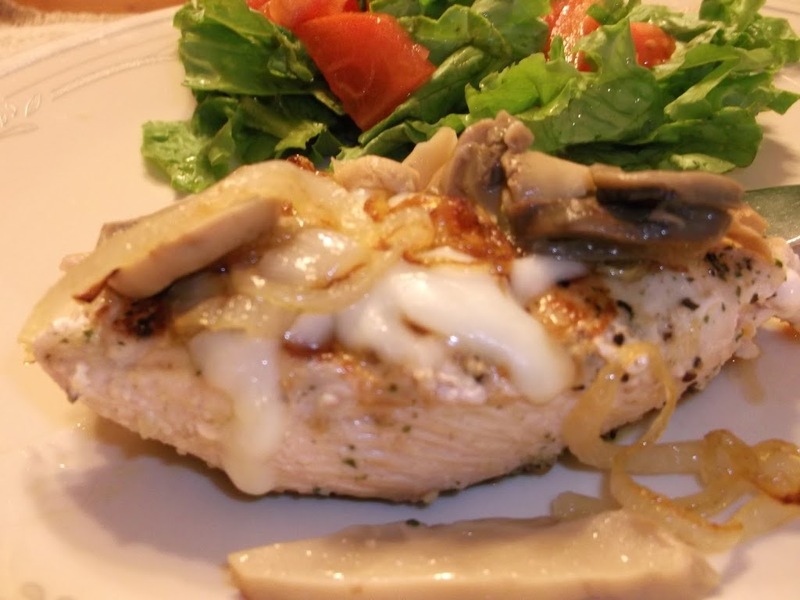 Your chicken looks delicious with the sautee mushrooms and onions…topped with cheese. Great way to prepare chicken. That’s a great recipe, and so easy to make! Your chicken looks great!